This page is about the aircraft F3F-2. For the premium version, see Galer's F3F-2. The F3F-2 is a Rank I American fighter with a battle rating of 1.7 (AB) and 1.3 (RB/SB). It was introduced in Update 1.55 "Royal Armour". 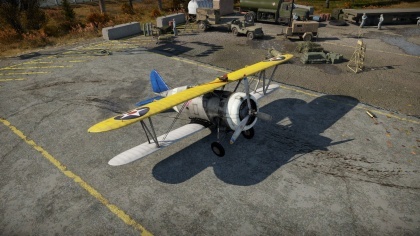 The F3F-2 is, as of War Thunder patch 1.69, the sole American biplane fighter outside of its premium variant. However, it is a very capable biplane fighter, and can be seen in-game as a rival to the USSR's I-153 Chaika. As expected with most Rank I fighters, but often considered "unusual" for an American fighter, the F3F is a pure bred turn fighter. Like the Chaika mentioned above, and the polar opposite in performance of the F2A that replaced it in service, the F3F can pull turns with relative ease, and also has a very excellent roll rate in addition to that, which when abused can provide a tough challenge for most of its opposition. It easily outclasses all reserve planes except the Ki-10 in maneuverability, and is on par with the I-153 in that matter as well. However, the F3F's BR can push it into the domain of Spitfires, late-model I-16s, Ki-43s (as well its bigger brother, the Ki-44) and of course Bf 109s, all of which are capable of easily disposing of its biplane opposition. It isn't the fastest or most climbable fighter either. Due to its lackluster armament (one M2 Browning machine gun with 200 rounds and one 7.62 mm Browning machine gun with 500 rounds), the F3F should mainly go after the fighter opposition, and not after bombers-leave that job to the P-40s. While it can carry two 100 lbs bombs, they are only effective against lightly armoured targets (armoured cars, artillery, AAA etc. ), and if carried early on in the match can weigh the plane down, affecting its flight characteristics a bit as a result. Leave the bombs until either the opposition goes passive for a while or air superiority can be obtained for a period of time over an opposing field of ground targets. The F3F is armed with one 12.7 mm M2 Browning machine gun, and one 7.62 mm Browning machine gun, both are located within the nose of the aircraft right above the engine. While this does mean gun convergence is not an issue, the two-gun armament can be lacking in both firepower and ammunition count; the larger M2 has only 200 rounds to play with while the smaller 7.62 has 500 rounds on hand. 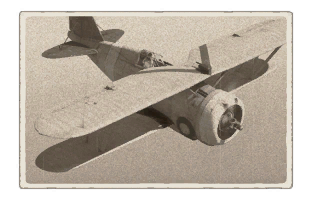 Nevertheless, this armament is decent enough to take down reserve and lightly-armoured Rank I planes down with relative ease and, if an experienced player is behind the controls, is capable of dealing with even rank II aircraft. The best air-to-air belts for the 12.7 MG are either universal or stealth belts (good amount of incendiary bullets), and universal belts should be used for the 7.62 MG.
8.5 mm Steel boxes in the fuselage. For firepower modules, outside of upgrades for the machine guns, the unlock of the module Mk.41 will allow the F3F-2 to mount two 100 lb AN-M30A1 bombs. The last biplane fighter in use by the United States Navy, the Grumman F3F first flew on 20 March 1935, and entered front-line service with VF-5B of USS Ranger the following March. The improved F3F-2 model-fitted with a more powerful Wright R-1820-22 Cyclone nine-cylinder engine-entered service between 1937-38 and proved to be the ultimate evolution of American biplane fighter design; it also earned the nickname "Flying Barrel" due to its modified engine cowling, which had to be larger to fit the new and bigger 1820 cubic-inch (29.88-litre) radial powerplant. The modifications allowed the updated fighter to accelerate to a higher top speed of 264 miles per hour (425 km/h), improved its clim brate from 2050 to 2750 ft/min (10.4 m/s to 13.7 m/s) and also expanded its service ceiling to 33,200 feet (10,120 m). Despite already being obsolete by the time it was introduced, Navy pilots loved the tough little Grumman fighter, and the F3F also influenced and provided a starting point for the design of Grumman's more successful wartime F4F Wildcat monoplane fighter. Eighty-one F3F-2s were procured, and served with VF-6 aboard the USS Enterprise as well as Marine squadrons VMF-1 and VMF-2. The last F3Fs in front-line use by carrier squadrons were gone by 1941 (replaced by newer Brewster F2A Buffalo monoplanes), but remained in use for training and transport duties during the first two or so years of the United States' involvement in World War II, the last of which was retired in November 1943. This page was last edited on 12 April 2019, at 00:20.